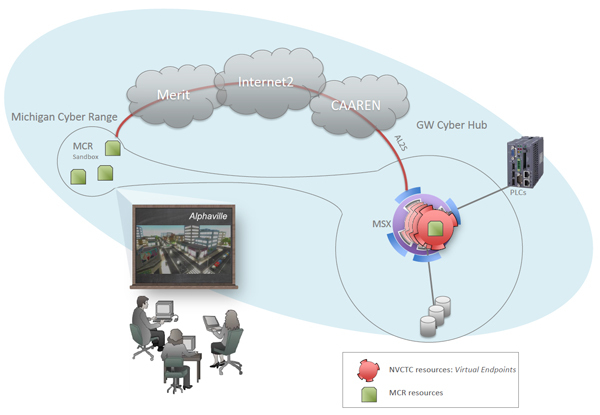 Hands-on cybersecurity training exercises with the virtual city of Alphaville will soon be available at GW through the new partnership with the Michigan Cyber Range (MCR), operated by Merit, and connected through Internet2 and GW's CAAREN network. The George Washington University is teaming up with the Michigan Cyber Range (MCR) to bring a cutting-edge cybersecurity training environment to GW’s Virginia Science and Technology Campus (VSTC). Made possible by a half-million dollar grant from the National Science Foundation (NSF), the SCEPTRE project will create a platform for training, research and experimentation. The two-year grant, awarded in August, will provide the GW Cyber Academy’s students and faculty with access to an advanced cybersecurity training facility through the new GW Cyber Hub – an expansion of Michigan’s Cyber Range. This new facility will become a regional hub for cybersecurity training by extending its offerings to other universities and businesses in the region and Commonwealth. GW will also develop and share educational and research resources. GW’s goal is to create a steady supply of traditional and non-traditional cybersecurity students at GW and regional institutions, as the demand for highly trained cybersecurity professionals is at an all-time high. Without training in a realistic, adaptable environment, these professionals are unprepared for the demands of protecting cyber infrastructures for organizations, institutions and businesses in the real world. The complexity of cybersecurity requires hands-on learning, a step beyond lectures and presentations. The Michigan Cyber Range provides a real-world environment to help train future cybersecurity professionals, with a virtual environment for cybersecurity research. The Cyber Range runs on the Merit Network, a regional research and education network infrastructure providing high-performance services for education, government, health care, libraries and nonprofit organizations. GW will use its own network infrastructure, the Capital Area Advanced Research and Education Network (CAAREN) to pair with Merit to bring the capabilities of the Michigan Cyber Range to the Campus. CAAREN will operate the GW Cyber Range, the test bed and research platform, and the new training facility, a hub on the MCR. GW’s Cyber Academy will develop and deliver courses and certificates. GW’s team includes the principal investigator, Dr. Jaroslav Flidr, the principal architect for Research Cloud Computing in GW’s Division of Information Technology (IT), along with co-principal investigators, Don DuRousseau, director, Research Technology Services, also in the Division of IT, and Dr. Frederic Lemieux, professor and director of Homeland Security and Police and Security Studies programs in GW’s College of Professional Studies. Flidr will be in charge of the system architecture, as well as the technical team and project activities, while DuRousseau will oversee partner relationships. Lemieux will be responsible for new curriculum development. Community partners, including universities and businesses in the region and Commonwealth, will also be able to create content and use CAAREN’s high-speed network to access the training environment. GW professors will develop new cybersecurity curriculum using these resources, which will be available to the larger community as adult education classes through the Northern Virginia Community College system. GW researchers will also have access to the Cyber Range to test studies in a repeatable environment with advanced networking on an open science platform. For more information about cybersecurity training opportunities, please contact [email protected]. For more information on CAAREN, please contact [email protected]. For information on partnerships in connection with this grant, please contact Don DuRousseau.